In diabetic nephropathy . . . Is there a proteinuria equivalent in heart ? Diabetes is a systemic disease affecting almost every cell that metabolises glucose .What begins as a minor functional impairment , worsens gradually and ultimately end up in severe structural changes.The basement membrane of cells face the brunt of the attack . (In the strict sense every cell has a basement but it is well developed only in kidneys ) . We also know , diabetes is able to inflict universal damage by targeting the vascular endothelial cells. In the kidneys DM makes the glomerulus more porous causing protein leak* and ultimately damages the tubules and end up in CRF. In the retina it excretes the proteinaceous material into the vital layers and result in retinopathy and progressive visual loss. In fact , there is a very close link between eyes and the kidneys Nephrologists hesitate to make a diagnosis of diabetic nephropathy without ocular changes. The peripheral vascular disease and diabetic foot are another expression of this microvascular dysfunction. What is the impact on cardiac micro-circulation ? When kidneys lose protein , cardiac capillaries lose proteins to interstitial space and result in progressive fibrotic reaction . We know extravasaation of high osmolar proteins can play havoc in cardiac interstitium ! Proteins are the particles of life . . . but in wrong places it can transform into deadly molecules in a fraction of time ! Hence , the cardiac protein leak in diabetes can cause any of the following clinico -pathologic entities. A mild left ventricular hypertrophy . How to recognize cardiac protein leak ? Clinically it presents either as angina or early heart failure symptoms ( not both usually ) .Diastolic dysfunction in echo, positive stress test , patchy thallium uptake abnormality often with features of syndrome X is also recognised. Many of the low flow or slow flow phenomenon in coronary angiograms might reflect micro-circulatory dysfunction . This is recognised by prolonged TIMI frame counts and prolonged coronary sinus filling and emptying time . 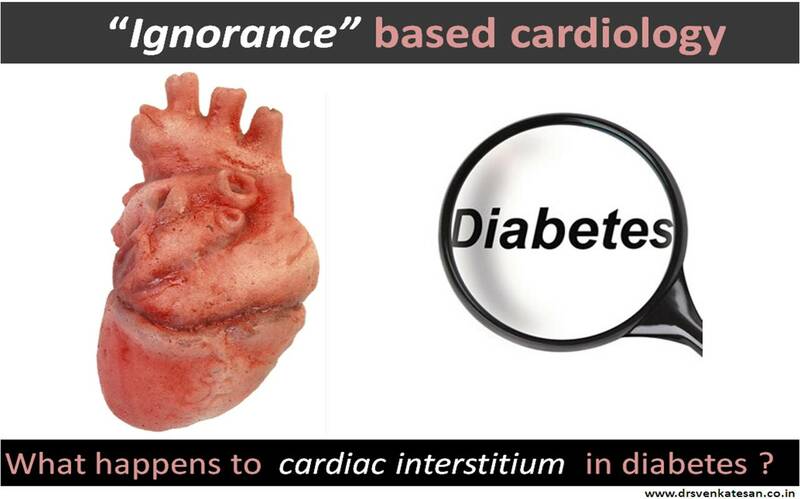 What about macro-vascular complications in diabetes ? How is it different from micro-vascular complications ? Though we expect a direct link between micro and macro vascular complication , the later appears to a patho-genetically independent process . This will be addressed later.